It was never going to be easy, if possible at all, for any sporting fixture last Sunday evening to compete with the scintillating excitement and drama of the Dublin and Cork All-Ireland hurling semi-final at Croke Park. I hold up my hands, and acknowledge that the above-mentioned match was top-class inter-county hurling and a really special game. Having watched the above clash on TV, and then rushed to a club football match was always going to be a difficult assignment, and was likely to make the club football seem really pedestrian. 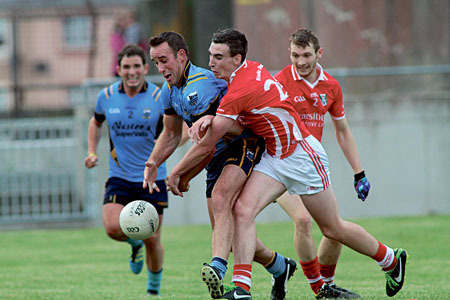 However, even allowing for the above, the reality is that the Tuam Stars and Salthill-Knocknacarra game at Tuam stadium last Sunday evening was particularly poor quality fare. The number of misplaced passes, unnecessary turnovers, poor touch, lack of real pace and wayward shooting, was difficult to watch. There was the odd exception, but not many. Both these teams were in last year’s county senior final and Tuam have been in two consecutive finals, beating the other big names in Galway club football along the way to those finals - which highlights the standard of club football in Galway at the moment. Team managers and their players aim to go out and play good quality football, but unfortunately club football in Galway is, in my opinion, of a poor standard. And while we are on about standards, some of the referring decisions in this game were totally unfathomable. Apart from the most partisan of supporters, there was little to cheer about. It was a game to be endured, not enjoyed, although referee Shane Hehir’s late penalty award to the Stars, which John Ross Bodkin scored, raised the decibel levels enormously and led to an exciting final few minutes. From my vantage point, a free out seemed the more logical decision. Salthill-Knocknacarra won by 1-9 to 1-8, with Seamie Crowe kicking a really tidy point at the finish to seal the win for Cathal McGinley’s side. The city team fully merited the victory and the players and their management team will not care about the standard of football in this win. They did what had to be done, and are in the last eight. They have the potential to improve considerably and it will be a very tough task for whichever club faces them in the next round. Full back Finian Hanley had a good game and, with Armstrong and Crowe capable of really hurting the opposition up front, they will fancy their chances of putting two titles back to back. Kevin Reidy and Jimmy O’Dea, who have been in charge of Tuam for two years, will be bitterly disappointed with some of the stats from last Sunday’s game. Their team did not manage a single score from play in the first half, and were 0-5 to 0-3 in arrears at the break. Furthermore, there was a gap of 30 minutes between their third and fourth point, and it took them 47 minutes to get a point from play - from Jamie Murphy. Admittedly Shane Curtin (Australia ) and Niall Quinn (injured ) who are both lively forwards were losses, as was Paul Doherty. Nevertheless, it was a poor performance from them, especially up front. It will be 20 years next season since Tuam last won a county senior title and they have only won four senior titles since 1962. That is only four wins in more than 50 years - 1984, 1988, 1989 and 1994 - which does not make pretty reading for such a renowned club. Salthill-Knocknacarra: S Nallen; R McTiernan (1-0 ), F Hanley, C Begley; C Halloran, G Canavan, D O’Flaherty (0-1 ); D Tierney, J Boylan; E Wynne, S Armstrong (0-2, frees ), B Conlon (0-1 ); G Cox (0-1 ), S Crowe (0-4, one free ), A Callanan. Sub, C Healy, for Callanan. Tuam Stars: J Trayers; D O’Rourke, I McGough, A Tierney; D Marley, T Costello, N Henry; D Connern, G O’Donnell (0-1 ); P Collins, J Murphy (0-1 ), E Donnellan; C Doherty, J Lawless, JR Bodkin (1-6, penalty goal, six frees ). Sub, S Gaffney, for Donnellan.